Click HERE for more on the Socialist Party of Malaysia. June 17, 2014 -- Links International Journal of Socialist Renewal -- The Parti Sosialis Malaysia (PSM, Socialist Party of Malaysia) ended its June 13-15, 2014, 16th national congress at Port Dickson on a high note, pledging to continue to play a dominant role in Malaysian politics as well as working towards a transition program to enable new leaders to take over and continue the task of building a strong party rooted in socialist ideology. Yes, the atmosphere was already set. The red flag leading the way to the venue was greeted by left leaders like Samsiah Fakeh, Lim Chin Siong and Veerasenan. The PSM continues to remain relevant in a country that at one point had a very strong left presence. Today the PSM continues to shoulder this enormous task. Venezuelan workers of the state-owned oil company PDVSA denounce US sanctions against their firm. End United States’ interference in the internal affairs of Venezuela! No sanctions against Venezuelan citizens! June 17, 2014 -- Links International Journal of Socialist Renewal -- We, the undersigned parties and organisations in the Asia region, condemn the moves by the United States government to impose sanctions on Venezuelan citizens it deems to have “abused human rights”. The US House of Representatives’ May 28m 2014, vote for such sanctions is a violation of the right of all nations to sovereignty and self-determination. The bill is not motivated by a desire to end supposed human rights abuses in Venezuela. Rather, it seeks to support the openly stated aims of Venezuela's right-wing opposition to overthrow the democratically elected government of President Nicolas Maduro. This is revealed by the bill's authorisation of millions of dollars of increased funding to opposition organisations in Venezuela – the same groups responsible for a wave of violence within Venezuela this year that has left at least 40 dead and hundreds injured. May 23, 2014 -- Links International Journal of Socialist Renewal --We, the undersigned organisations, strongly condemn the latest coup d’état staged by Thai military under the leadership of Prayuth Chan-ocha. The coup is set to protect the interests of the section of Thai ruling class who want to reduce the democratic space in order to consolidate its power. 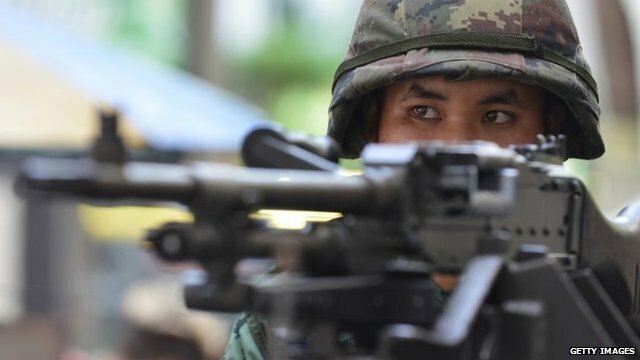 The military junta in Thailand has no interest in bringing about free and fair elections to solve the political crisis, and certainly will not protect freedom of expression, which it sees as a threat to its rule. S. Arutchelvan (Arul), secretary general the Socialist Party of Malaysia. May 14, 2014 -- Links International Journal of Socialist Renewal -- The 2014 May Day rally in Kuala Lumpur, the capital of Malaysia, was the biggest in the country since 1947 when the British colonial authorities violently repressed the labour movement, which had become one of the most strongly organised in Asia, having organised the majority of the workforce. Links International Journal of Socialist Renewal spoke to S. Arutchelvan (Arul), secretary general the Socialist Party of Malaysia. He was also spokesperson for the May 1 Committee. Arul will be one of the international guest speaker in the People's Power in the “Asian Century” seminar to be held in conjunction with the 10th national conference of the Socialist Alliance, in Sydney June 7-9, 2014. For more details of the Socialist Alliance conference and to register see HERE. For more on the Socialist Party of Malaysia, click HERE. The May Day protest in Kuala Lumpur looked very big? What is your estimate of the size and was this the biggest ever May day? February 20, 2014 -- Links International Journal of Socialist Renewal -- The Socialist Party of Malaysia (PSM) is deeply concerned over the current situation in Venezuela where the Bolivarian Revolution is threatened by violent attacks from the far-right opposition, which aims to restore the oligarchic rule of big business and corporate interests in Venezuela. Venezuelan right-wing opposition groups launched their latest assault on February 12 2014 by staging violent demonstrations to destabilise the Bolivarian government led by President Nicolas Maduro. Violent clashes took place and resulted in three deaths, including the death of Juan Montoya, a revolutionary community leader and staunch supporter of the Bolivarian Revolution who died from gunshot wounds in Barrio 23 de Enero. The latest incident is reminiscent of the events that led to the failed coup against then President Hugo Chavez on April 11, 2002. Right-wing opposition forces backed by the US government have employed such tactics many times in Venezuela in their attempt to defeat the Bolivarian Revolution and to restore the ancien régime which championed the savage neoliberal economic order. PSM secretary general S. Arutchelvan. February 13, 2014 -- fz.com -- The Parti Sosialis Malaysia (Socialist Party of Malaysia, PSM), together with some other groups and individuals, is forming a body called Left Coalition to bring class politics to Malaysia..
PSM secretary general S. Arutchelvan said it is looking at forming the coalition with Parti Rakyat Malaysia, Solidariti Anak Muda Malaysia and other activists and individuals. "We are trying to bring back class politics. We feel the younger generations are actually more receptive to more radical and progressive ideologies... The 1969 (May 13) racial riot and the Cold War have not corrupted their minds. They don’t have this fear of communism because they live in a different era. And when the government said communism is evil, there were a lot of counter arguments in the social media. We think it’s the time for the left to grow”, he told fz.com. 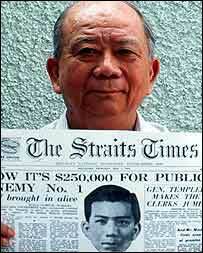 An astute observer of Malaysian politics, Arutchelvan felt that after 1969 and the implementation of the New Economic Policy (NEP), Malaysian politics had moved from class politics based on left or right ideologies to racial and religious politics. Celebrations following the release of the EO6. Ex-detainee Choo Chon Kai in centre. Photo by Alex Cheong. October 8, 2013 -- From reports in the Malaysian press -- The Malaysia government has agreed to pay six Socialist Party of Malaysia (Parti Sosialis Malaysia, PSM) members RM200,000 (approx. US$63,000) following the settlement of the lawsuit filed for false imprisonment at the High Court. The six were detained in a bus on June 25, 2011, on charges of treason and were released on July 2 when their remand period expired. They were re-arrested under the (now repealed) Emergency Ordinance (EO) and freed 27 days later on July 29. The detentions resulted in an international solidarity campaign.The detainees became known as the EO6. The PSM credits this solidarity campaign for their comrades' release. Prime Minister Najib Razak's government scrapped the Emergency Ordinance and other tough security laws in December 2011 following criticism that they were abused to silence dissent. October 3, 2013 -- Socialist Party of Malaysia/Links International Journal of Socialist Renewal -- The first Monday of every October is designated by the United Nations as World Habitat Day. The main purpose to celebrate this date is to reflect on the basic right of all to adequate shelter. The UN has dedicated one day to highlight the plight of people fighting for shelter as it seems that the right to a home is one of the most fundamental human rights. With this, let me argue the case of kampong Hakka in Mantin, Negeri Sembilan. When I first stepped into kampong Hakka a year ago, I was amazed that a Chinese new village complete with temple, community hall and school existed in this village and I was further shocked to learn that all the people living there have been declared illegals just because some rich company has bought their land. When I looked at the structure of their homes and their lifestyle, I was convinced that these villagers have a history to talk about. They have lived here for many decades. Most of the villagers were elderly people as their children had left to more urban town centres. Their economic activity varies, with most of them being petty traders and self-employed. Socialist Party of Malaysia's general secretary S. Arutchelvan being arrested. October 1, 2013 -- Links International Journal of Socialist Renewal -- Please spread the news that the Socialist Party of Malaysia's general secretary S. Arutchelvan (Arul) and 11 other protesters have been detained. Please contact the Mantin Police Station to question the arrests and demand the release of those detained. Call chief inspector Rashid on 0675812222 to demand their release. Please email solidarity messages to int.psm@gmail.com. Call 12 orang termasuk Arul ditahan polis kerana pertahan pemaju roboh Kg. Hakka, Mantin. On September 30, 2013, in their effort to stop developers from demolishing Kampung Hakka Mantin, five residents and seven activists were arrested by police. It is also reported that one resident was injured during the commotion. Among those picked up was Socialist Party of Malaysia (PSM) secretary-general S. Arutchelvan. Around 90 residents and activists gathered at the village in Negri Sembilan, attempting to negotiate with the developer, police and court representative, who came to demolish the houses. The negotiation broke down at 11.20 am, and the authorities proceeded to detain those trying to stop the demolition. August 28, 2013 -- Socialist Alliance -- The Socialist Alliance condemns the threatened US-led Western military assault on Syria. We call on the Australian government to reject this latest imperial aggression, to extract itself from its military alliance with the US and end its involvement in all aggressive multinational military operations. The Socialist Alliance supports the Syrian people’s democratic uprising against the tyranny of the Bashar al-Assad regime but we reject the interventions of the US and its allies in Syria. The Syrian people should have the right to decide their own future. The horrendous chemical weapons attack on civilians is being used as the justification for this latest intervention. The use of chemical weapons is a heinous war crime and whoever uses it should be brought to account. August 19, 2013 -- The Socialist Party of Malaysia (PSM) strongly condemns the bloody crackdown on protesters by the Egyptian army. We are deeply concerned over the current situation in Egypt where the revolution is hijacked by the military establishment. The use of excessive force for the last few days has killed more than 800 people and wounded thousands. Political violence has spread across the country as retaliation to state repression, and innocent people have been victimised. Morsi was removed in a military coup on July 3 after massive protests initiated by Tamarod, a movement that opposes Morsi and calls for an early election. The military coup was not aimed at deepening the revolutionary process but to contain the revolutionary waves. The current atrocities committed by the military is not just aimed at crushing the Muslim Brotherhood, but is also part of a plan to derail the Egyptian revolution and bring back Mubarak-era repressive rule. Today, supporters of Muslim Brotherhood have become the target of the violent crackdown, but tomorrow any other forces that pose a threat to the military ruling elites will by also subject to brutal repression. The military and security forces in Egypt have been committing atrocities all the while with impunity, making them the fundamental threat to Egypt's struggle for bread, freedom, social justice and human dignity! Anti-TPPA protest outside Malaysia's parliament on July 16. The statement below was released by the Socialist Party of Malaysia (PSM) on July 10, 2013. The PSM is deeply concerned about the ongoing Trans Pacific Partnership Agreement (TPPA) free trade agreement. The 18th round is to commence in Kota Kinabalu in east Malaysia from July 15 until July 25. Since its first inception as the United States-Malaysia bilateral Free Trade Agreement in 2006, the PSM has consistently protested the decision of the Malaysian government to enter into such negotiations. It was very clear since then, that the FTA is part of the agenda of US corporations to expand and control trade in the region. Having failed to impose their interests via the World Trade Organisation, US corporations quickly lobbied Congress to start bilateral agreements with the countries in Asia. Threatened by the growing economies of China and India, the US and European Union are competing to control trade for their respective interests. It is another form of imperialism that will negate our national sovereignty. Now, after the fast track to negotiate the FTA during the Bush administration expired in 2007, the TPPA is a renewed approach for the same goals. TPPA is FTA on steroids.